At sea, royalist ships continued to fly the Union Jack of 1606 and the appropriate ensign (different in England and in Scotland before 1707). The parliamentary navy was ordered by the Council of State on 22 February 1649 as follows: "that the ships at sea in service of the State shall onely beare the red Crosse in a white flag". The appropriate order was signed by Oliver Cromwell on 23 February. On 5 March 1649 the Council ordered "that the Flagg that is to be borne by the Admiral, Vice-Admiral, and Rere-Admiral be that now presented, viz., the Armes of England [Red St. George Cross on white] and Ireland [gold harp on blue] in two severall Escotcheons in a Red Flagg, within a compartment." Scotland was only formally reunited with England by an Ordinance of 12 April 1654 which ordered: "That the arms of Scotland viz: a Cross commonly called the St Andrew's Cross be received onto and borne from henceforth in the Arms of this Commonwealth ... etc"., and according to Perrin (P64) the saltire of Scotland did not reappear on naval flags until an Order of the Council of State dated 18 May 1658 (the jack and from c1653 the flag of subordinate Generals at Sea continuing as the impaled arms of England and Ireland). According to "The flagshop" this is a naval ensign of 1659; though I do not know if that means Richard Cromwell's Protectorate or the briefly restored Parliamentary regime. The coat of arms of the Commonwealth (1649-60 [sic]) from Friar (1993). The arms of the Commonwealth appeared on the Great Seal struck in 1655. Interestingly these arms retained symbols of royalty (Crowns, Helm etc.). The arms of the Lord Protector Oliver Cromwell were incorporated into the new design. Blazon: Quarterly 1 and 4 Argent a Cross Gules [for England] 2 Azure a Saltire Argent [for Scotland] and 3 Azure a Harp Or Stringed Argent [for Ireland] on an Inescutcheon Sable a Lion Rampant Argent [Cromwell's arms]. The establishment of arms shown above, are actually those of the 'Protectorate'. These arms cannot date from before 12 April 1654 when the arms of England and Scotland were once again joined together, and (with the addition of the Lord Protector's inescutcheon) are very probably later than this. Timothy Wilson, Flags at Sea (1986) shows on page 20 a personal standard of Oliver Cromwell: quarterly, first and fourth white with a red St. George's Cross (England); second blue with white St. Andrew's Cross (Scotland); third blue with yellow harp (Ireland); and overall an escutcheon bearing Cromwell's personal arms (sable a lion rampant argent). This standard replaced the Royal Standard which was flown by the Lord High Admiral at sea. I recently persuaded the National Maritime Museum to show me the sole surviving example of a naval flag from those times, which is in store and not on display, a photo of which I attach. The Generals at Sea flew a standard very like this, but you will notice straightaway that the cross and harp are in escutcheons which look more like tombstones than the traditional shield shape. This standard, if authentic, would have flown during the First Dutch War and the subsequent war against Spain in which Blake so distinguished himself. The reason that it alone survived is speculated as this: it was made in error (the tombstones) and shoved into a chest and forgotten. Thus is escaped the destruction of all Commonwealth symbols at the Restoration of Charles II. It reappeared in the eighteenth century and was on display at Chatham dockyard until eventually it ended up at the NMM. Laird Clowes who saw the flag when it was still at Chatham suggested that it might have been a boat flag, or possibly a jack. The shape of the shields is not unique. Some ships in the Anthony Roll have shields of this shape along the sides. The 'compartment' flag lasted a relatively short time and was replaced by the plain old cross and harp, which was also the design for the naval jack. This compartment was yellow and might have been oval or perhaps rectangular and inside were the two escutcheons (right way up and pointed at the bottom) with cross and harp. All this was on a red field. It ended up being used by the vice admirals. I think the important thing which concerns me is the shape and orientation of the escutcheons. The Commonwealth's 'logo' was the cross and harp side by side in pointed shields. This device appears on coins, medals and in books, as well as on the engraved sterns of ships. I know of no other instance - apart from the problematical Standard - where the escutcheons are otherwise. Which is why I really want to get to Amsterdam when the Rijksmuseum and the Scheepsvaatmuseum are open again after their period of restoration. The Dutch painters were so good at the detail in their pictures of the battles of the First Dutch War. The designs go through the standard so that the Harp is always further from the hoist. But it faces the wrong way - all other harps I know of face left; this faces right. The flag stored at the National Maritime Museum (which was originally at Chatham and exactly matches the example shown) is 464 x 625 cm - see Tim Wilson's Flags at Sea P19 and Plate XI - which makes it (at over 15 feet wide) the correct size for a command flag of this period? The First Dutch War was beautifully covered in paintings by the Elder Van de Velde, and a study of these might well reveal whether the addition of a wreath to the more usual command flag of a general at sea was more than a 'one-off'? I consider Nick's theory that the mistaken placing of the escutcheons upside down may well have caused the flag to be stored (rather than issued) makes a great deal of sense, although it is possible that the addition of a wreath may well have been an unused trial? As noted above, the shape of the shields themselves is not that unusual. The red flag bearing two escutcheons and surrounded by a green wreath was established for senior generals at sea (replacing the Royal Standard) in 1649 (exact date lost but certainly prior to 21 April). These same escutcheons on a yellow oval, being the flag of junior generals at sea, was dropped (and replaced with the same design as the jack) in March 1653 - see Perrin, pp 63-4. The right way up is a simple matter of England should be at the hoist, and Ireland's harp the right way up. As to why it was put away rather than corrected, your guess is as good as mine? Perhaps it was ordered by (General at Sea Blake) himself, and he forgot to collect it? My knowledge of this particular period is not good, but of course, England and Scotland were separate countries until the Act of Union of 1707 and the 1605 Union of Crowns dissolved by the execution of Charles I in 1649 (and only restored by the accession of Charles II in 1660). As far as I know the Scottish saltire did not appear on English naval flags until 1658? Sir William Laird Clowes wrote, in collaboration with others, a seven volume history "The Royal Navy", published in 1898. In volume 2 page 115 is a drawing of the flag with measurements 1'.9" and 1'.3". [Sic: feet seem to have been converted to inches.] "At the same time it was directed that every man-of-war should carry on her stern an escutcheon containing in one compartment a red cross, and in another a harp. This escutcheon seems to have suggested as a flag of command, instead of the Union, a flag bearing the arms of England and Ireland in two escutcheons on a red field within a compartment 'or'. In the case of a vice or rear-admiral, the compartment seems to have been unornamented. In that of an admiral, it was encircled by a laurel wreath. A variant of this flag is still preserved in an old chest in the house of the Admiral Superintendent at Chatham. Through the kindness of Staff-Commander J.E. Coghlan, R.N., I am enabled to illustrate and describe it. It measures 21 inches by 15 inches [sic]. The field is red; the encircling wreath is green; the English excutcheon bears the red St George's Cross on a white ground, and the Irish escutcheon bears a yellow seven stringed harp on a blue ground. I take this to have been an Admiral's boat flag. It may, however, have been a jack." I have recently read a suggestion that the Standard at the National Maritime Museum could have been a prototype, run up quickly for approval by the Generals at Sea, and that it was put aside and forgotten - and thus survived. A theory just as good as any other so far! One other thing that has bothered me about the NMM standard was the placing of a green (vert) wreath on a red (gules) background - colour on colour? 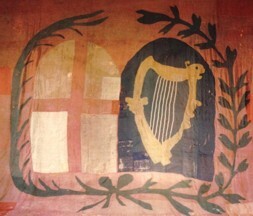 The flag is red with the shields of England, a red throughout cross in a white shield, and Ireland, a golden yellow harp shaped like a female angel in a blue shield, in the centre. The latter is slightly superimposing the former. Both shields are surrounded by a green wreath of laurel. The flag is golden yellow and has a red bordure. In the middle of the yellow field are the shields of England, a red throughout cross in a white shield, and Ireland, a golden yellow harp shaped like a female angel in a blue shield. The anniversary of Cromwell's death, on 3rd September 1658, was marked at the Cromwell Museum, Huntingdon, on Saturday 4th September, with the display of a replica of his cavalry guidon or flag. The Cromwell Museum, part of Cambridgeshire County Council, has been at the centre of the programme of events this year to mark the quatercentenary of Cromwell's birth in 1599. The flag, known more accurately as a guidon, which has an elaborate lance style pole, was made by members of the Lord John Robardes Regiment of the Sealed Knot and was presented to the Cromwell Association on 25th April, Cromwell's bithday, earlier in year. The Association has generously deposited the cornet with the Museum. The recreation is based on evidence from a contemporary manuscript. It is on display in the Museum above the arms and armour. The colour of the major's company of an infantry regiment. Lord Robart's Regiment of Foot fought on the Parliamentary side, but under the Earl of Essex in 1642-44, and not under Cromwell. The flag size was 6' 6" x 6' 6", the canton (being the George cross in the top corner) was 2' 2" square. It has a 'wavy pile', this being a wavy point tapering to about a third of the diagonal across the flag. Colonels = Plain red colour. Lt Col's = Plain field with canton of St. George. Majors = Red field, canton and wavy pile. I think that this must be Oliver Cromwell's banner from the time when he was Lord Protector; May 1657 until he died in September 1658. Part republic, part monarchy; hence the crown. I guess that O P stands for Office of Protector. I think the OP on the flag actually stands for 'Oliver Protector', in the same way that ER stands for Elizabeth Regina. There is a portrait of Oliver on an Irish Roll of Account with the inscription 'Oliver by the Grace of God Lord Protector of the Commonwealth of England', which I think sums it up.